Beech Hill House at Witherslack is the family home of Jenny and Stuart Stott. Deceiving in size from the front because the house is square it was once two cottages that were turned into a four bedroom bungalow. In 1987 when Stuart bought the bungalow he took the roof of and converted into a four bedroom family detached home. The house is situated just off the A590 at Witherslack. With junction 36 of the M6 motorway being an 8 minute drive away the house is perfect for those travelling to and from Scotland who are looking for somewhere to stop-over and break their journey. The house, being where it is makes a welcome break for those walking the Cumbrian Coastal Way. 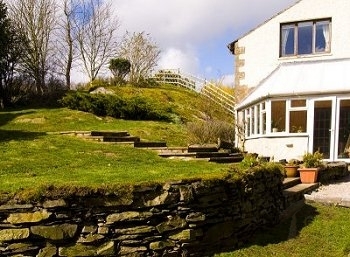 Now offering bed and breakfast accommodation the house is situated in a rural location on a good road network and ideally suited for both business and recreational visitors to the Lake District and South Lakes and Furness Peninsula areas. 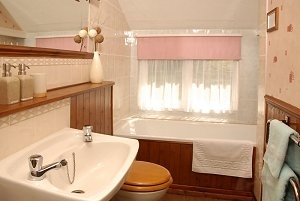 All bedrooms are en-suite, have king-size beds and are spacious. One room has its own private balcony with table and chairs. Two have duel aspect views looking onto the gardens and surrounding countryside and one has wonderful views looking across to Whitbarrow Scar. Visitors take breakfast in the conservatory and have use of their own sitting room. The gardens are a mixture of landscaped areas mingled with the natural rocky areas located around the house. Whatever the season, whether it be Spring, Summer, Autumn or Winter the house is in an ideal location for visiting the Lake District, the Furness Peninsula, North Lancashire and the area leading into the Yorkshire Dales. Room 1: A superior en-suite room situated on the first floor with a king-size bed and private balcony. The balcony, that nestles into the garden's Lakeland rock has a table and chairs and is a lovely place to sit and relax. With steps leading from the balcony into a private part of the garden you can walk down the sloping gravel path onto the drive. Tastefully designed and furnished with your comfort in mind this luxury room has dual aspect views overlooking the gardens and surrounding countryside. 1 night (Based on two people sharing) ..........................£42.00 p.p.p.n. 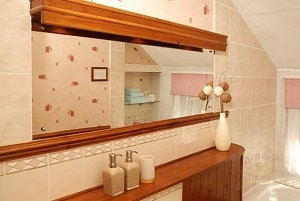 2 nights (Based on two people sharing) .........................£40.00 p.p.p.n. 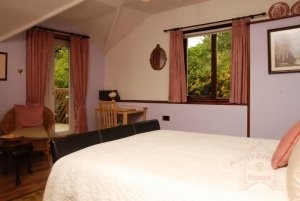 3 nights or more (Based on two people sharing..............£38.00 p.p.p.n. Single Occupancy of double room ................................... £52.00 p.n. Children under 5 if require the use of a single bed (when sharing a room with two adults) ..........................£10.00 p.c.p.n. (when sharing a room with two adults) .......................... £15.00 p.c.p.n. Children 8 years and over but under 14(when sharing a room with two adults) ..........................(Those 14 years and over are treated as adults and the normal adult rate applies) ...... £20.00 p.c.p.n. Dog (includes dog bed, throw, water bowl & treats) ...... £4.00 p.d.p.n.